Every operator has a different and specific strategy aligned to its specific business goals, capabilities and culture, and ever operator wants to focus on simplifying and harmonising various operational functions that result in better customer service at optimum cost. Today operators want to capture new revenue streams while increasing operational efficiency and align ever changing technology with market needs. With competition becoming fierce and technology changing at a speed of thought, operators need to keep razor sharp focus on customer satisfaction and increasing operational efficiency. Operators need to utilizes various levers, as depicted in the image below, to cater to the operational areas. These include drivers such as people and process, operational efficiency, business growth and customer satisfaction amongst others. TCTS puts into place a thorough PMO and governance philosophy to manage the complexity and challenges faced in the journey. Leveraging the legacy of telecom operational knowledge, TCTS is uniquely positioned to provide consultative services on operations strategy. It exercises the operational model that is based on eTOM framework and utilizes ITIL best practices for its own and as well as customer operations. The services range from building operational organization structure, governing framework, aligning operations to business objectives, supporting operation setup, aligning business with go-to-market strategy, and other strategic operations. 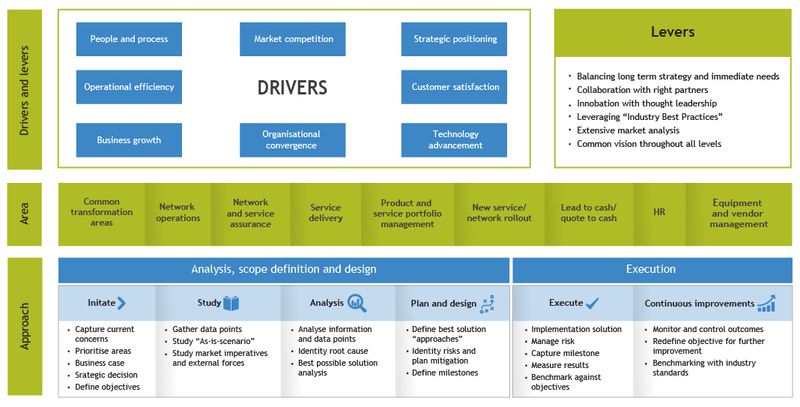 TCTS' Organisational Strategy Service enables CSPs to evolve their current network, operations and businesses to face the ever changing technology as well as market challenges. TCTS practices a two-phased approach that focuses on deliverables at each phase. In this phase, TCTS resources gain a deep understanding of current “pain points” and challenges faced by the operators. The identification process addresses different business components of the company i.e. organization and process, IT, network & technology, customer experience, etc. The operator's present status in presales, delivery and assurance, organizational processes and customer experience, is matched with relevant KPIs in order to set a starting point (As-Is). The issues arethen identified, highlighted and prioritized according to business operational and technical criteria. Finally, a set of objectives are defined from the selected criteria. With relevant dimensions mapped and measured in place, key pain points arethen mapped following which, TCTS develops the solution and implementation roadmap. The action/program plan is then broken down into the necessary steps to reach the desired end-state. These steps are then grouped into work-packages, and scheduled and assigned to specific individuals.